When we left the shores of the USA behind us, I was still knitting. I had almost 86 rows left and all the tassels to attach. Luckily, I had thought to cut and bag the tassels in advance of my flight, so I didn’t have to carry around 7 skeins of wool all over England. Our tour, to say the least, was whirlwind, and I’m still recovering. This did not leave much time for knitting, so I made sure I knitted while riding across the English countryside and then set myself up in the lounge of one of our hotels so I could monitor the comings and goings of my charges while still clacking away with the needles. The result was success! On the last possible travel day, before we reached the city limits of **Westminster, the scarf was complete! ** Trivia Fact – LONDON is unique as a capital which comprises TWO CITIES . The CITY OF LONDON dates from Roman times, and now measures , and is referred to as , THE SQUARE MILE, having its own police force, and as boss, the Lord Mayor of the City of London. Traditionally, he acknowledges the monarch, but is top dog in the City. The Kings were royal, but they often needed the city merchants’ money for their wars or whatever, so had to get loans from them . So it has continued to be the centre of financial matters, where the Stock exchange is based as well as all the City guilds etc. Referred to simply as ‘the City ‘ e.g. I work in the City = with a capital C , means within that heartland of business. Otherwise you would say ‘I work up in London’ . N.B. One always goes UP to London, no matter whether you travel physically south and downwards according to the map! The City of Westminster contains Buck Palace, Westminster Abbey , shops , restaurants, theatres et al.It is known as the West End. Originally, Westminster grew up on a little island in the Thames where the Benedictine monks settled in the 7th century, founding their abbey. Minster in the west. The saxon regional kings lived in various places and England was only one united realm in 973 when Edgar was crowned King of all England in Bath. Then William came from Normandy and we got tainted with French blood – fact, 205 of England is still owned by those of Norman descent!! and that’s after nearly 1,000 years. He based his capital at the Tower site, just within the Roman eastern boundary line . 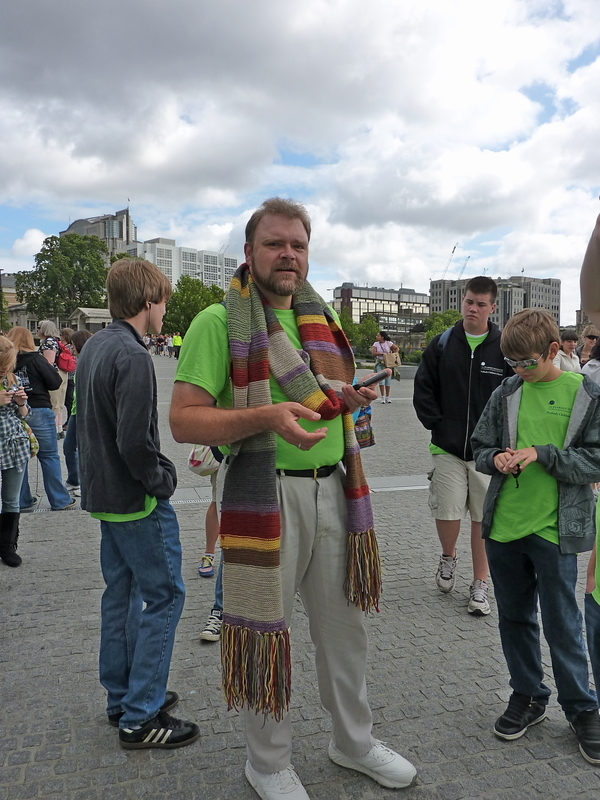 The picture above is of Hubby with the Scarf’s debut at the Tower of London. It was a big hit with the lime green shirts we had assigned for the day and made it’s rounds around many different necks. It’s slightly over 14 feet long and seems to be growing longer with every wearing as the yarn pulls and stretches due to its weight.